The furisode is the standard formal kimono for unmarried women. 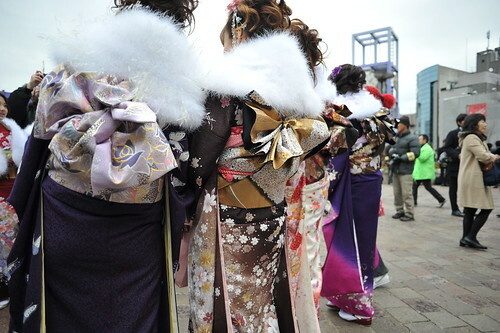 There are three types of furisode – o-furisode (large), chu-furisode (medium) and ko-furisode (small). Furisode with the longest sleeves (about 120cm) are called hon-furisode. The sleeves of the o-furisode reach almost to the hem. It is worn by the bride as one of her wedding outfits during her wedding reception and would have 5 light, undyed family crests. For a highly-patterned furisode, a single embroidered crest is used instead so that it does not stand out. Chu-furisode have calf-length sleeves, and are worn at the coming-of-age ceremony. However, many people now wear an o-furisode as it is more formal and can be worn at wedding receptions and other events as well. Furisode kimonos are now usually made from glossy monrinzu (patterned satin) or mon isho chirimen (crepe) with an elegant pattern. The sleeves of ko-furisode reach the knee, and are worn together with a hakama for graduation ceremonies. Many different kinds of obis can be worn with furisode. A zentsuu (full-patterned) or rokutsuu (partial-patterned) Nishikiori obi or a Karaori (Chinese weave) obi matches well with the prints of the kimono. Some suitable prints for the obi are ox-carts, fans, butterflies, shippou (a geometrical design of circles), tortoise shell and tatewaki (a geometrical design of curved lines). The nagajuban should be a specific one made for furisode and the obiage should be a soushibori obiage. Either a gold-thread hiragumi (flat braided) or marugumi (round braided) orijime can be used. The zori and bag can be made from the obi fabric, leather or brocade.